Why exactly is HDL-cholesterol good for us and LDL-cholesterol bad for us. It has been well-established that LDL-cholesterol is associated with atherosclerosis and that HDL-cholesterol helps remove excess LDL-cholesterol from the circulation. From a biochemical view, however, what is the difference between the molecules that causes this difference? What blood tests generally report is HDL-C and LDL-C, that is the amount of cholesterol in HDL or LDL respectively (again, cholesterol is always the same molecule, whether in an HDL or in an LDL). HDL (high density lipoprotein) and LDL (low density lipoprotein) are lipoproteins, aggregates of proteins and lipids that can carry, amongst other things cholesterol. There are 5 major types of lipoproteins, called chylomicrons, VLDL, IDL, LDL, and HDL and are distinguished by their size, density and the proteins they are composed of. 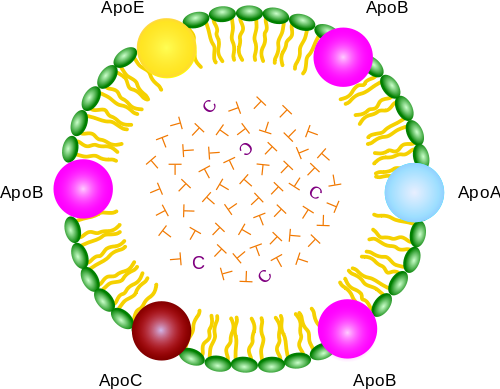 In the picture, the "balls" represent proteins, called apoproteins, and the C represent cholesterol and T tryglicerids, which are both lipids. As you can see, all the fats are inside the lipoprotein, but the exterior, being soluble in water can be easily dissolved in the blood. It is very important, at this point, to note that lipids are a physiologically important part of our organisms. All the cells in our body contain lipids: the membrane of each cell in the body is made up of lipids (called phospholipids) and also contain cholesterol. In fact, cholesterol is extremely important for the correct functioning of the body as, for instance, it is used as the base to make many hormones (the so-called steroid hormones, such as estrogen, progesterone, cortisol, testosterone etc). However, too high levels of lipids, particularly cholesterol, are not beneficial, as high cholesterol levels have been in fact linked to many cardiovascular diseases, which we hear a lot about these days. So, because HDL tend to remove the lipids from the circulation and bring them back to the liver they can be considered as some sort of "cleaners", that remove excess cholesterol from circulation. Not the answer you're looking for? Browse other questions tagged biochemistry metabolism fat-metabolism or ask your own question. Is eating salt dangerous for the brain? What is the actual function of HDLs and CETP? Is there a way to quantify in vivo cholesterol transport rates?